The saga of Louis Sarno has never been a secret. In the 1980s, American writer and musicologist visited the remote Bayaka Pygmy clan in the Central African Republic to record their unique music; with time, he settled among them, married a member of the tribe and started a family. In 1993, he published a memoir of his experiences, followed by an album collecting the Bayaka’s earthy acoustic melodies in 1996; in 2010, Lavina Currier’s feature-length “Oka!” fictionalized Sarno’s journey with Kris Marshall cast as an embellished version of Sarno. But the true record of his unique tale finally comes together in “Song From the Forest,” documentarian Michael Obert’s perceptive and utterly gorgeous look at Sarno’s life today and his experience returning to his old haunts in New York. Through an elegant juxtaposition of jungle and city life, “Song From the Forest” (which takes its name from Sarno’s book) not only shows what drew Sarno to the Bayaka’s world, but the impulse that kept him there. Delicately shot by cinematographer Siri Klug, “Song From the Forest” begins with an abrupt immersion into Sarno’s life, where he’s surrounded by lush greenery in every direction and the spiritual profundity that the tribe’s solitary life has provided him. It doesn’t take long to establish why he loves it there, but despite the degree of his integration he remains tied to his earlier roots: a scrappy radio provides him with news from the outside world, and he continues his affinity for classical music, which Obert conveys through a soundtrack that blends the Bayaka’s sounds with 16th century renaissance chants. The resulting portrait of Sarno’s existence could form a compelling project by itself, but Obert effectively digs deeper to magnify Sarno’s distaste for his old home with an appropriate hook: After his adolescent son Samedi grows ill, a bereft Sarno promises that he’ll take the child to see the world if he manages to pull through; once he does, Sarno takes Samedi on a trip to New York, where Samedi seems more curious about the allures of urban life than his father ever was. The resulting odyssey reflects a greater meditation on the value of Sarno’s work recording the tribe’s sounds by hinting at its newer generation’s desire for assimilation. 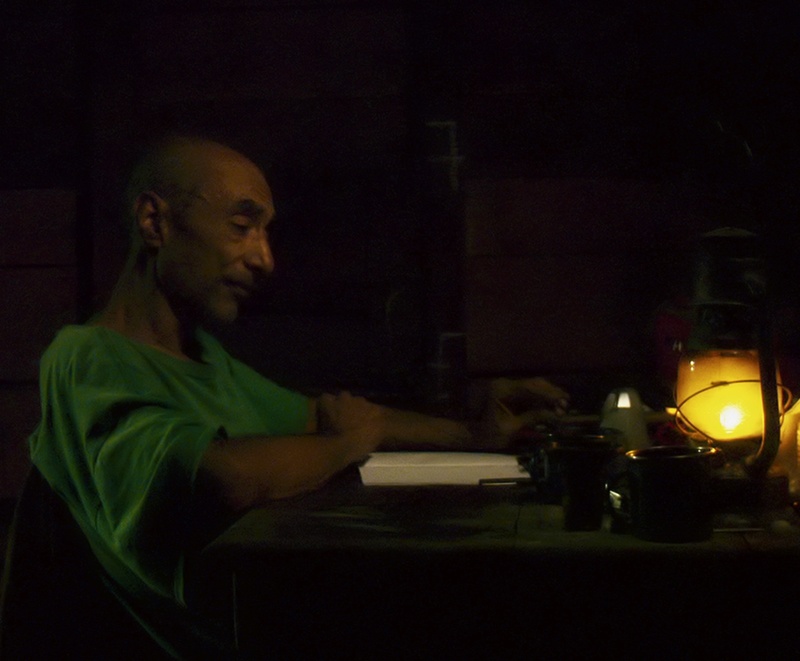 Before it gets that far, however, “Song From the Forest” explores Sarno’s desire to abandon his roots with an ongoing audiovisual contrast between civilization and the tranquility of his Central African life. Among those reflecting on Sarno’s choices, a key figure is his old pal Jim Jarmusch, who explains how the radicalism of their youth led Sarno to immerse himself in a culture divorced from the complex socioeconomic pressures of the Western world. “You realize how artificial it is,” Sarno says. Even so, not everyone around him comprehended the move — as his suburban-dwelling brother explains, their father only came to accept Sarno’s unorthodox life choice on the older man’s death bed. For Sarno, however, the music speaks for itself. He was drawn to the Bayaka after hearing a snippet of their sounds on the radio, and ultimately became their greatest chronicler. His recordings, comprised of over 1,000 hours and 25 years worth of sounds, capture the communal aspect of the music and the way it blends with the natural surroundings. It has a uniquely fragile dimension — “a sound not to be heard again,” as Sarno puts it — which makes the value of his work to other researchers unprecedented, as several of them interviewed in the movie attest. Obert also reveals how the level of integration that Sarno experienced as he recorded these sounds has extended to his daily life: The filmmaker reveals snippets of Sarno speaking with his fellow villagers in their native tongue, helping them with their medical needs, and bargaining for local supplies. He seems so fully a part of their world that the prospects of leaving them is unthinkable — which makes his eventual trip a source of much intrigue. When the eventual voyage takes place, it confirms Sarno’s lack of interest in his past, while showing his consternation with the way the rest of world (particularly doctors) regard him like a museum object. However, by primarily unfolding in the present, “Song From the Forest” leaves Sarno and the Bayaka in the same mysterious state that so many others see them in. The means by which he fell in love and decided to start a family, in addition to the relationship that the rest of the tribe has with the world beyond the jungle, remain somewhat frustratingly unclear. However, that never detracts from the movie’s success as a form of first-rate ethnographic storytelling. By documenting Sarno’s worldview, “Song From the Forest” compellingly foregrounds the ephemeral nature of all culture. Additionally, by demonstrating the intrinsically beautiful quality of the Bayaka’s ways, it merges with his mission. “Song from the Forest” opens theatrically in New York this Friday and in Los Angeles on April 17 followed by other cities.